In the Renaissance, the summers were warm and lords & ladies were eager to spend their days in the country, away from the stale air of their castles. Fresh meadows carpeted with flowers and sparkling streams are all reflected in the design of our lightweight Renaissance kirtle. 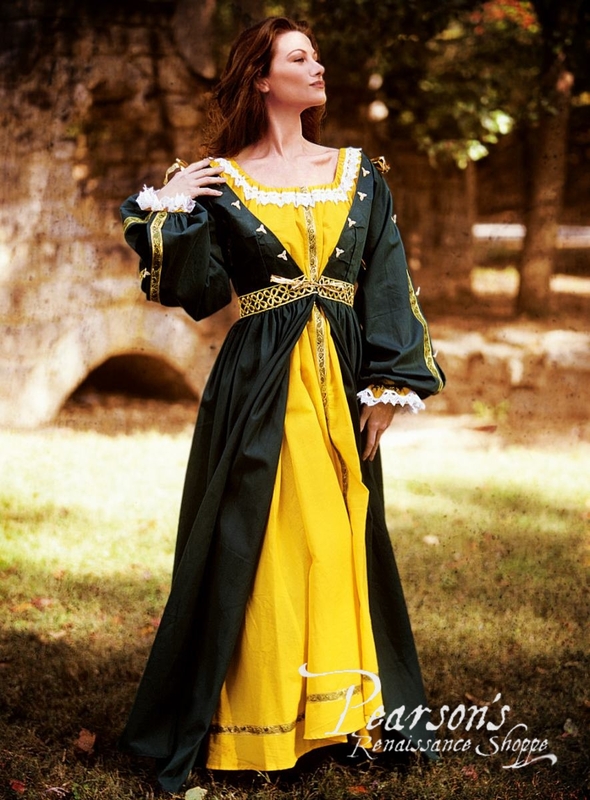 This kirtle in brilliant green drapes over your shoulders and fastens at the waist. The graceful, wide sleeves are slashed and richly decorated with golden trim. Our lightweight Renaissance kirtle measures approx. 58 inches from the shoulder seam to the hem. PLEASE NOTE: The yellow chemise is sold separately.